The Choquequirao trek is a truly spectacular hike that plunges down into the Apurimac canyon and then up again to the fascinating ruins of Choquequirao. While this is a quite tough trek, you are rewarded with spectacular views the whole way. Choquequirao comfort trek enables you more time in the ruins and more time to get to the ruins. Location: About 4 hours drive west of Cusco. We will depart early in the morning in a private bus. 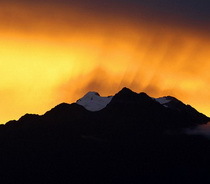 After crossing the Kunyak Bridge over the Apurimac River, we will arrive at the town of Cachora (10, 200 feet). There, we will prepare to begin the trek and our muleteers will be awaiting us with the horses ready to go. 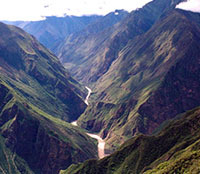 We will begin to descent through the Apurimac Canyon. 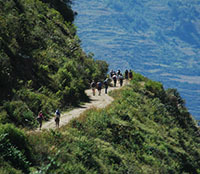 On this trail we will see some parts of the archaeological zone of Choquequirao, the snowy mountain chain of Vilcabamba. The plants and animals will begin to change on account of the climate and altitude. In the afternoon, we will arrive at La Playa Rosalina on the banks of the Apurimac River (5115 feet). This will be the most arduous day. We will walk to the mountain early in the morning because when the sun shines it heats up the area significantly. 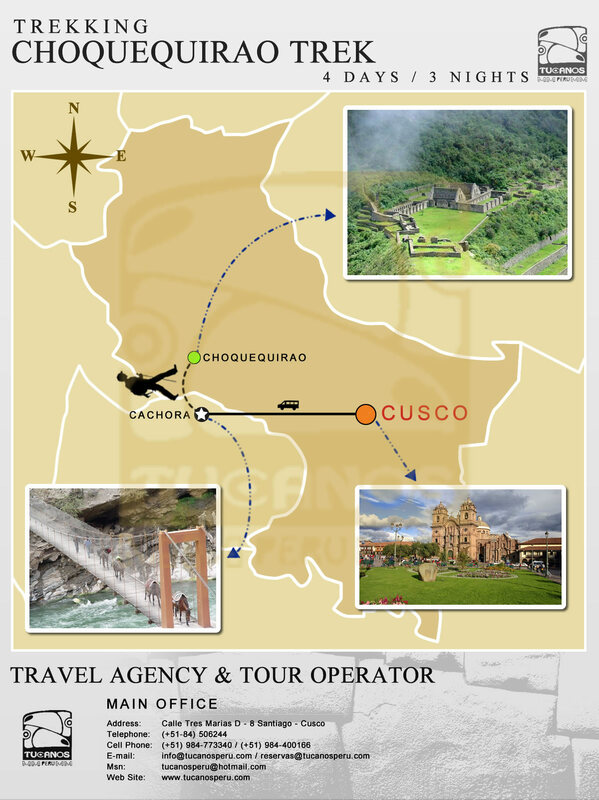 On this morning we will be walking in the Cusco region side of the mountain. We will see different types of orchids, Andean bears, some birds, and with luck, the mighty Andean Condor! 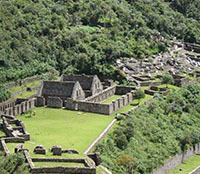 In the afternoon we will arrive at Choquequirao where our camp is located very close to the archaeological center. In the morning, we will have a guided tour of the beautiful city of Choquequirao after which we will set off on the return to Playa Rosalina arriving at the camp site there in the afternoon. Early in the morning we will begin the walk toward Cachora. There, our bus will be waiting to take us back to Cusco.